Pennsylvania Secretary of Education Pedro Rivera (right) visits Sto-Rox Junior-Senior High School on Sept. 24 to discuss funding issues with Superintendent Frank Dalmas and others, including Lori Sims, principal of the district's Primary Center and Upper Elementary (left), as well as high school Principal Tim Beck (center). While in Pittsburgh Monday, Pennsylvania Secretary of Education Pedro Rivera made a stop at the Sto-Rox Junior-Senior High School. Inside the principal’s office, Rivera met with Superintendent Frank Dalmas to hatch a plan: How can the struggling district share services with other districts so that students will have access to more classes and opportunities? “Are you comfortable approaching your colleagues about this?” Rivera asked. “I think that’s doable,” Dalmas said. The superintendent first plans to go over the idea with the Sto-Rox district school board. Sharing services with other struggling districts could allow them all to add programs and services — such as Advanced Placement courses that administrators in Sto-Rox have a hard time dedicating staff to when few students take the courses. Rivera visited Sto-Rox Monday afternoon on his way back to Harrisburg. 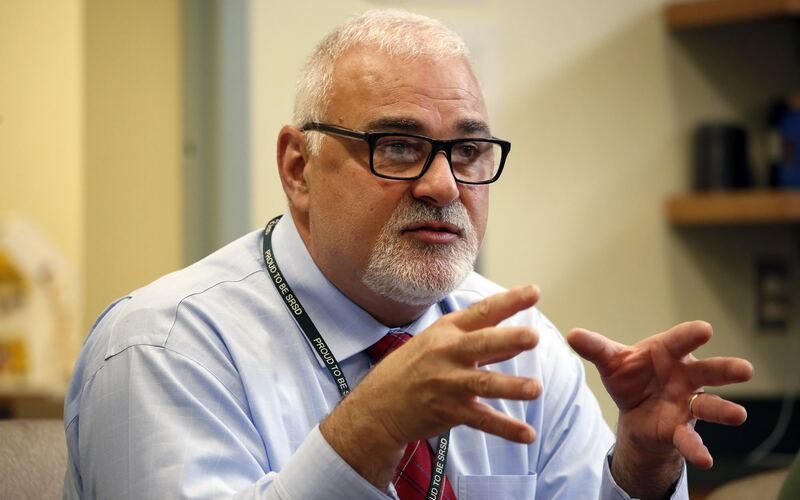 While Rivera said he had a “balcony-level” idea of many of the issues that were going on in Sto-Rox, spending time with administrators just before the school bell rang to the end the day allowed him to see nuances that can get lost from afar. Rivera did not tour the school or meet with students. PublicSource profiled the disparities Sto-Rox students face as compared to their neighbors in the Montour School District. In a July interview with Rivera, PublicSource informed him of some of the disparities between the Sto-Rox and Montour districts. 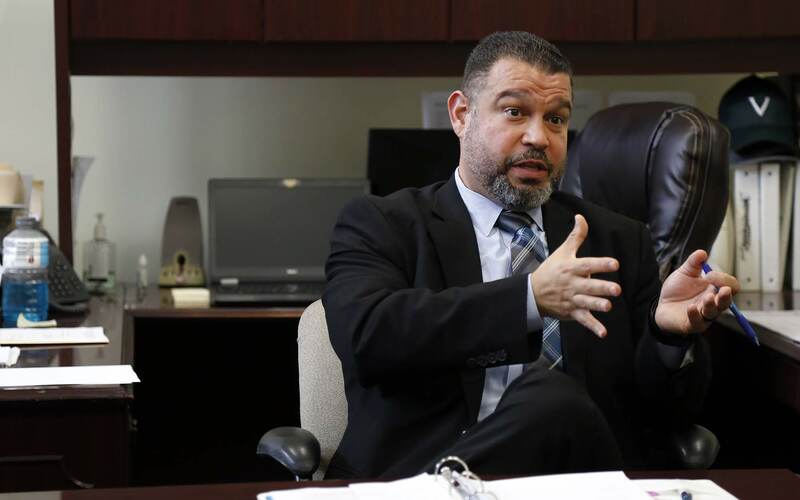 Rivera, at the time, said the Pennsylvania Department of Education [PDE] doesn’t have the authority to force sharing among districts but that he and others highlight partnerships because they hope to see more of it. The comparison between Sto-Rox and Montour came up in throughout the meeting between Rivera, Dalmas and others from the district. In Montour, elementary students have access to a Brick Makerspace, filled with LEGOs and other building materials and equipment. “They have a whole area based on artificial intelligence, and we hope that a computer turns on when we start it up in the morning,” Dalmas told Rivera. At Sto-Rox, where 79 percent of the about 1,300 students were economically disadvantaged in 2016-17, students have learned to do without. Students have said they rarely get actual books in class, instead being provided printouts of the classics. Class offerings, like upper-level Spanish, have been cut over the years and teachers recently took a pay freeze to avoid furloughs. Administrators wear many hats. 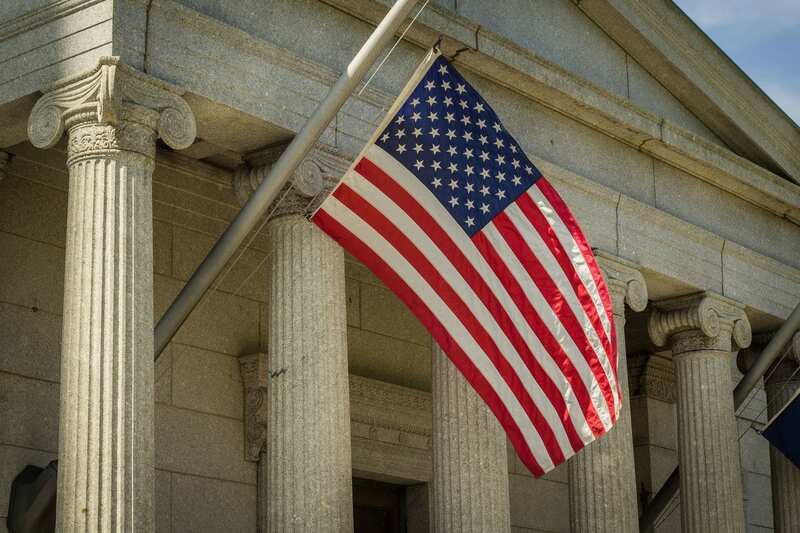 Dalmas told Rivera how his day ends with responsibilities more akin to a district director of facilities, where he sometimes needs to hand-deliver toilet paper. Others in the small administrative team who joined Dalmas in the meeting shared with the secretary how much they believe is at stake. 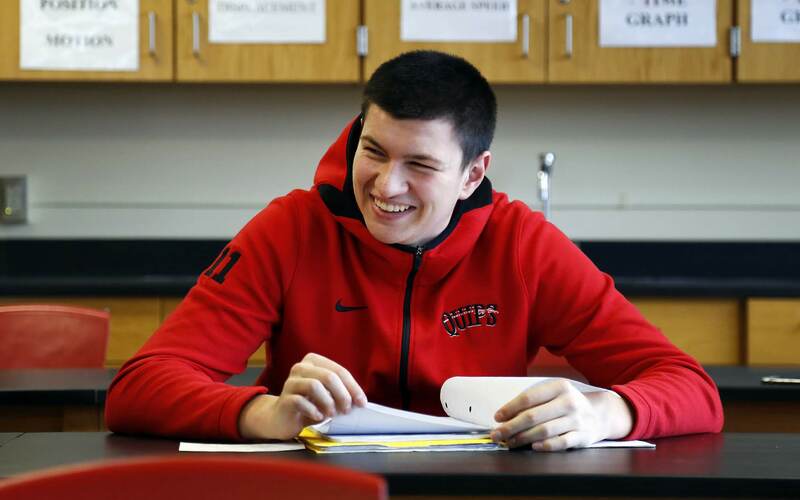 “I think if we turn the school around, we will hopefully turn the community around,” said board member Tyler Kochirka, a 2005 Sto-Rox graduate who said he thinks the district is on a pendulum ready to swing in an upward direction. On the other end: “If the school disappears, the community will die,” said elementary principal Lori Sims, who grew up just across the street from the high school and has worked in the district for 30 years. 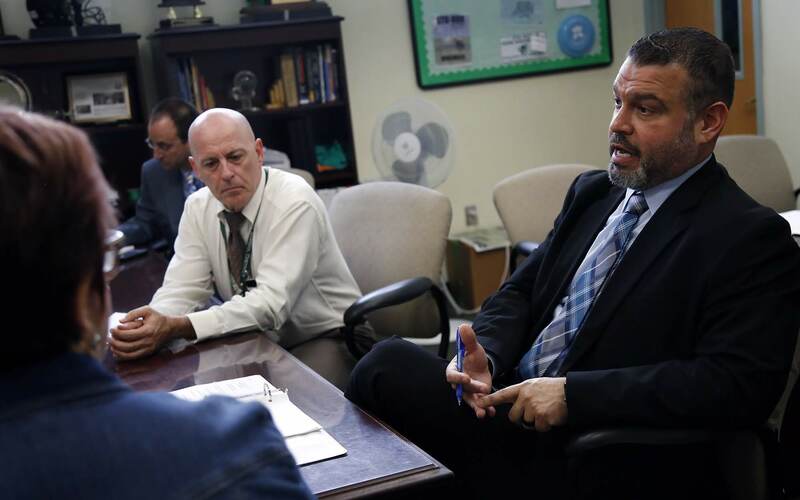 Sto-Rox School District Superintendent Frank Dalmas and others meet with Pennsylvania Secretary of Education Pedro Rivera on Sept. 24 to discuss funding issues. However, for districts like Sto-Rox, he said it’s challenging because only new funding is run through the formula. “Pretty much, you were rewarded for hiring a grant writer,” Rivera said. Yet districts that are struggling and have administrators wearing multiple hats couldn’t afford that. Now, grants that go through the department will be awarded based on need, Rivera said. Sto-Rox also struggles because it has “no tax base,” Dalmas said. With the way funding is structured for public schools in Pennsylvania, wealthier districts rely heavily on local tax dollars. Poorer districts, including Sto-Rox, don’t have that advantage; state funding makes up a larger proportion of their budgets because they can’t raise as much money off of property taxes. The issue is at the center of a Commonwealth Court case that argues the state underfunds schools and that its method of distributing education funds is flawed because its reliance on local revenue fails to ensure that all school districts have the resources necessary to provide an adequate education to students. While the Mall at Robinson and large corporations pay local tax dollars in Montour, Dalmas laughed that all Sto-Rox has is Mancini’s Bakery. Sto-Rox administrators said they’d like to see funding support for services like transportation. 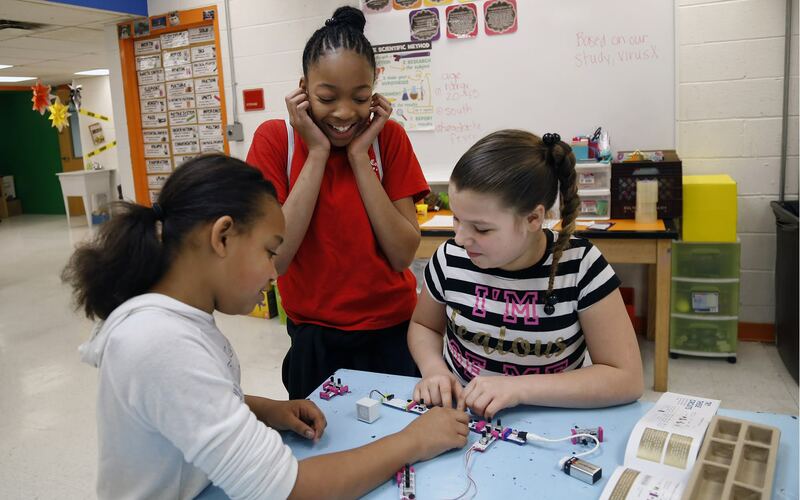 Without adequate funding for busing, after-school events are difficult to offer. Parents are afraid to let their kids walk through the community to school, said Tim Beck, the principal of Sto-Rox Junior-Senior High School. Rivera said the PDE has run feasibility studies for school mergers. “The problem continues to be takers,” he said. Who will accept the smaller, less affluent districts? Pennsylvania Secretary of Education Pedro Rivera visits Sto-Rox Junior-Senior High School on Sept. 24 to discuss funding issues with Superintendent Frank Dalmas and others. Dalmas agreed that’s the problem. If Sto-Rox approached a district like Montour about a merger, “they would form a line with a torch in one hand and pitch fork in the other,” he said. Shared services, though, is something he thinks everyone would get behind. Having the support of Rivera and the PDE makes it easier to tackle, Dalmas said. Sto-Rox currently does not have any arrangements to share services with other districts. The conversation with Rivera has spurred him to want to change that. Stephanie Hacke is a freelance journalist in Pittsburgh. She can be reached at stephanie.hacke@gmail.com or on Twitter at @StephOnRecord .